When it comes to this gorgeous stunner, consider me a Pescetarianism. 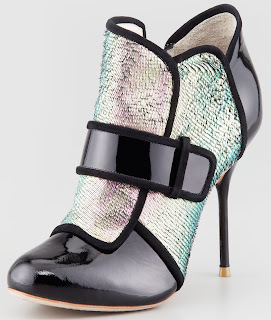 We're hypnotized by this Sophia Webster Amis Holographic Mermaid Bootie and its scaly, asymmetrical, holographic suede upper colorblocked with patent leather and trimmed in suede, layered crossover vamp, and pencil-thin, 4" patent-covered heel. Thank goodness we have legs, unlike those poor mermaids, and are able to enjoy this stunning holographic beauty. This is the best time to get the Amis as they are now $312.00 at Neiman Marcus, down from $695.00.